Inside DCAT Upcoming Conferences Get the Book! 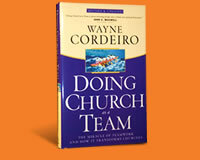 Doing Church as a Team underscores that numbers are insignificant without providing a way to involve every individual. You can't do it all yourself. No one can. However, if the team works together as one toward a single, clearly define goal anything is possible.